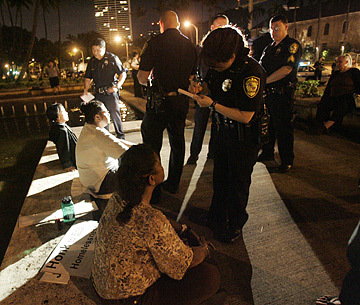 Leinati Matautia, front, Siuea Utuloa "Utu" Langi and Julia Matsui Estrella were cited by police March 27 for remaining in front of Honolulu Hale after the homeless and their supporters were asked by Honolulu police officers to move to the sidewalk. Two advocates for the homeless were wrongfully arrested during a protest at Honolulu Hale and should be compensated by the city, a civil rights group argued in a federal lawsuit filed yesterday. Mayor Mufi Hannemann said he had not seen the lawsuit by yesterday afternoon, but added that he believes the arrests were lawful. The American Civil Liberties Union of Hawaii is suing on behalf of Siuea Utuloa "Utu" Langi and Julia Matsui Estrella, who were arrested while protesting the nighttime closure of Ala Moana Beach Park in March. Last week, the ACLU filed a motion in Honolulu District Court seeking to have the charges dropped on the grounds that they violate the advocates' First Amendment rights and that authorities misapplied state law in charging them with criminal trespass. The federal complaint seeks monetary damages in an amount to be determined at trial. "The arrest and continued prosecution of (Langi and Estrella) has burdened them and has caused them to suffer damages including but not limited to emotional distress," the lawsuit states. Although he had not seen the specifics of the case, Hannemann said he believes the arrests will hold up in court. "There was no attempt to discourage one's right to protest," Hannemann said. "I believe those two individuals were arrested because they were breaking the law. "It has nothing to do with interfering with their right to protest or the fact that we didn't want people to come to City Hall to advocate for the homeless." Estrella and Langi were among about 100 people who marched to City Hall on March 27 to demonstrate after police began enforcing a nighttime closure of the park for around-the-clock maintenance and cleanup. Most protesters cleared out or moved off the grounds. Estrella, Langi and two others left at first but soon returned to continue their protest. All were then arrested and charged with criminal trespassing. Estrella and Langi are fighting the charges while the others pleaded no contest and sentenced to time already served. The ACLU contends the arrests violated the advocates' constitutional right to assemble and protest. It also argues that the law used to charge the protesters was misused, because the statute applies only to trespassing on private commercial property, not public property such as Honolulu Hale. "We are confident that once the administration has the opportunity to review the lawsuit it will see that, in fact, these individuals were targeted by the police because of the content of their message and subjected to unlawful arrest under a statute that does not apply to public property," ACLU attorney Lois Perrin said. Honolulu Prosecutor Peter Carlisle's office has said it is continuing to research case law and the legislative history with respect to the charges and the ACLU's challenge. A pretrial hearing is scheduled Aug. 22.